After a long and cold winter, we wanted to head somewhere warm and colorful to start off Spring: Marrakech. After hearing so much about the wonders of the city, we wanted to see it for ourselves. One thing is certain: either you’ll love it, or you’ll hate it, but there’s no way that Marrakech will leave you indifferent. Personally? We loved it! So - just for you - we gathered some of our favorite spots. 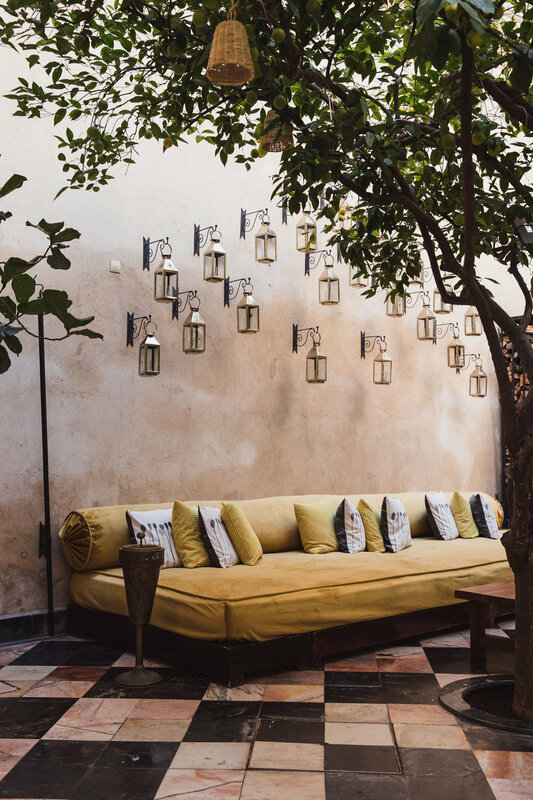 Riad Jardin Secret - Conceived by a Parisian couple – Cyrielle & Julien – both with backgrounds in the fashion world, nothing was left to chance in Riad Jardin Secret. The timeless and colorful decoration of the place was inspired by Moroccan history and by the “anti-modern way of life” as they like to define it themselves. The riad really has a laid-back atmosphere that makes you feel relaxed right away. And that’s the goal after all, isn’t it? There are 6 different rooms, each with its own style. In every single one of them, you’ll find some of Cyrielle & Julien’s personalities and some of their favorite books. Riad Jardin Secret is also a creative riad, welcoming and hosting artists in residence, offering them a calm and creative atmosphere. You can have lunch or dinner on the so-called “Pink Rooftop” of the riad. It’s a lovely vegetarian restaurant with a slight hippie-vibe that offers gourmet cuisine. They support local farmers and sustainable agriculture and opt for organic ingredients only. Even though the food is healthy and vegetarian, the plates reflect the colors of Morocco. Everything’s tasteful and well presented! We absolutely fell for this restaurant. Dar Housnia - A simpler and more affordable riad, decorated with taste and located in the heart of Marrakech’ Medina. An authentic marrakchi riad, with all the necessary comfort. What we liked the most about it was the hospitality and the warm welcome the hosts gave us. The team is like a small family and makes you feel at home at all times. Another plus? The small swimming pool that allows you to cool down on warm days. For animal lovers we’ll add the foster cat, which isn’t shy at all. El Fenn - A magnificent riad, cherished by celebrities. This is the perfect compromise for those that want a luxurious yet still warm and convivial place to stay. We appreciated the colorful decoration, the lovely staff and the amazing views from the roof terrace. It’s a really quiet spot, despite its location in the heart of the city. For all the animal lovers (again! ): you’ll have the honor to live with a family of resident tortoises for a couple of days. For everyone else: the swimming pools, the restaurant, the bar, the spa and the library will satisfy all your needs. Let’s now be honest and get to the main point: the tasty food in Marrakech. From pastillas and tajines to couscous, there’s something to suit all tastes! Our food crush of the trip was the Foundouk! We had some grilled sardines and tasted the best tajines of the whole journey. The atmosphere is cozy and intimate, despite the size of the restaurant. The rooftop terrace offers a panoramic view on the medina. There, you can enjoy Moroccan, but European food as well. Not to be missed! We also tried La Famille, which is a small veggie restaurant. We mostly go there for the relaxed and somewhat “bobo” atmosphere that reigns, even in the middle of the crowded souks! Be careful though, we faced some difficulties in finding the place, even though we had the right address. If you want to have a drink or a meal while enjoying another rooftop view, head to Atay Cafe. And if you want to eat in the middle of the Medina, go to Fnaque Berbère. But it’s not always necessary to look further: some riads offer pretty good and more familial food. Not only does Marrakech offer good food, the city is also very cultural. You won’t get bored easily! Its countless floral gardens and monuments will not leave you cold. One of the must-do’s in Marrakech remains, year after year, the Jardin Majorelle, the ancient residence of Yves Saint-Laurent. 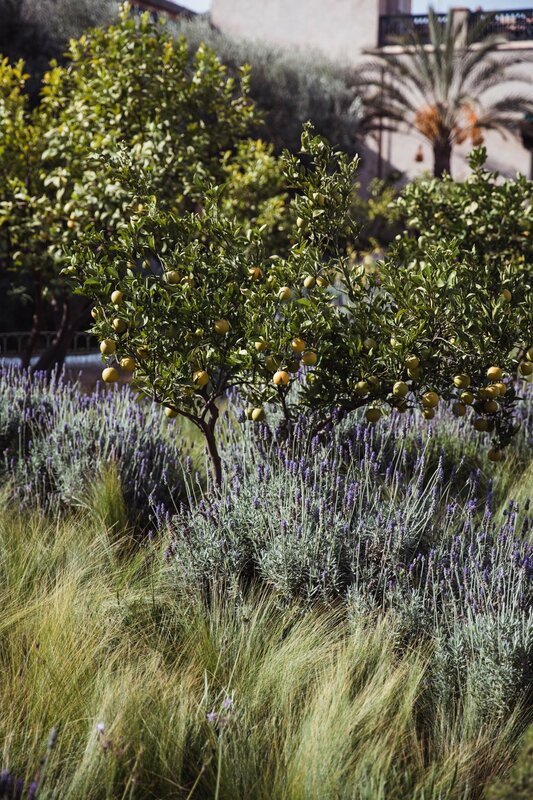 Over almost half a hectare, you’ll have a walk throughout trees, exotic plants, water basins, fountains, the whole surrounded by the renowned Majorelle blue. Next to the garden, you’ll find the Yves Saint-Laurent museum, there to satisfy all fashion addicts (even during their holidays)! If you’re craving more green, we’ve got another cool option for you: Jardin Secret. The exotic garden is filled with plants coming from all over the world and will make you discover more about Islamic art and architecture. You can also go to the gardens of La Mamounia, filled with olive trees, rosebushes, orange trees, cactuses, palm trees, bougainvilleas, … guaranteed change of scenery! After that, head to Beldi Country Club, the hotel has its own souk for craftsmen. There, you’ll find non-profit embroidery collectives, pottery, Berberian rug-makers, … and the last Moroccan factory of Beldi glasses. For all the art lovers, we’d recommend going to Riad Yima; a shop, gallery and tea room at the same time, conceived by the artist Hassan Hajjaj. Oscillating between Morocco and London, we find a bit of both cultures in his creations, only made from recycled materials. After all those discoveries, what could be better than enjoying a day away from the city’s hustle and bustle? About an hour’s drive from Marrakech, you’ll have the chance to have a preview of the Agafay desert, where you can drive quads, ride dromedaries, or even sleep in a tent. What would be Marrakech without its famous souks? You can easily make some good deals in there, but negotiating skills are crucial. It is not always easy to get the expected price, and patience is an essential weapon. In order not to get ripped-off, you should have an idea of the “real prices” in advance. Our absolute crushes in the souks were textiles (rugs & cushions) of course, but also the imperfect and gorgeous Tamegroute ceramics, as well as the speckled ones from Fès. Of course, you can find some other nice goods such as baskets, slippers and leather sandals for example. If hustling and negotiating aren’t your thing, but you still want to go back home with some nice souvenirs, head to Chabi Chic. It offers a wide and pretty range of local handcrafted products, but at Western prices. You can find everything there: tableware, delicatessen, decoration, cosmetics, jewelry, candles as well as the Tamegroute ceramics. Another thing we couldn’t keep ourselves from buying are the Beldi glasses we mentioned earlier. You can find them in the craftsmen souk of the Beldi Country Club, at Chabi Chic, or even at a cheaper price in the souk itself. And last but not least : our love for design and decoration led us to our long-time friend Laurence Leenaert, founder of LRNCE. You can visit her showroom - which is located a bit outside of the city center - on appointment. We love her colorful and sunny creations. And if you like those too, stay tuned…we are up to something! This unique taste of Morocco made us want to try out and discover new cities over there in the (near) future… We will be back without a doubt!